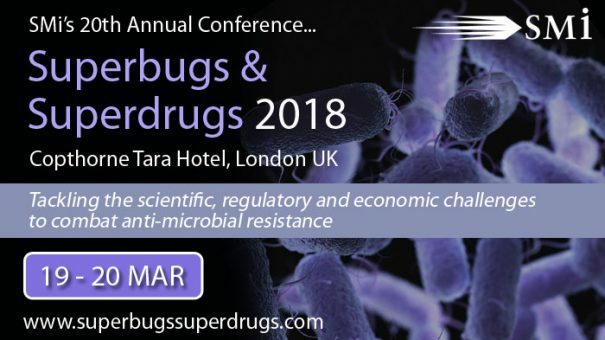 The growing global threat of antimicrobial resistance, research strategies aiming to eliminate resistance, latest scientific advancements for tackling resistance, as well as potential novel candidates and antimicrobial alternatives is the focus for SMi’s 20th annual Superbugs and Superdrugs conference. It will take place in Copthorne Tara Hotel, Kensington, London on the 19th and 20th March. The topic of Superbugs & Superdrugs has continuously evolved and developed in the two decades the event has been running. This year, senior industry experts will be exploring the latest developments and breakthroughs in antibiotic resistance. Core issues surrounding funding and initiatives, breakthroughs in drug discovery, improving the antibiotic pipeline, resistance prevention and much more will be discussed in depth at the event. The event will have an emphasis on the current approaches pharmaceutical companies have in developing new therapeutics & drugs, obtaining funding for new projects, and the question of why there’s a lack of incentives for researchers working in antimicrobial resistance research. The event will also explore the latest novel candidates and alternatives to antibiotics, including Contrafect’s Lysin Products, as well as Professor Ian Henderson’s research using Apheresis. Visit http://www.superbugssuperdrugs.com/pharmaphorum for more details.